TOLEDO, Ohio, February 20, 2012 – On the heels of recently released census data showing the first drop in the share of science and engineering professionals since 1950, SSOE and area firms are promoting entry into the profession by participating in National Engineers Week. 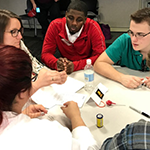 Approximately 30 students from three area high schools will get hands-on experience from a team of engineers when they spend part of their day at SSOE’s Toledo headquarters for the “Engineer for a Day” program. SSOE has been a part of the Toledo community for over 60 years and has grown to be the largest engineering and architectural firm in the region. The “Engineer for a Day” program is a part of the agenda for the 2012 Toledo Engineer Week and will be held on February 22, 2012 from 1:00 until 3:30 PM. Students will attend a luncheon at The University of Toledo College of Engineering before meeting at SSOE. While there, they will experience first-hand what it takes to become an engineer and potentially an employee of SSOE. To start the afternoon, students will get an overview of project management. This will include a brief discussion on the role of a project manager. It will be followed by a team building activity featuring Legos which will allow the students to demonstrate project management principles. The second topic of discussion will cover electrical engineering. SSOE presenters will discuss their roles within the company followed by an interactive activity in which hot dogs and pickles will be cooked with just a few wires and a battery. Once complete, the students will be able to taste test the end result. The day will wrap up with a demonstration of industrial control systems from two SSOE food and beverage process experts.